At Nevada Eye Consultants, we are dedicated to providing the highest quality vision care available. Our board certified eye doctors are among the most experienced in the nation. Through continuing education and unsurpassed investment in technology, we are prepared to provide unsurpassed results. Our caring staff and physicians are dedicated to total patient satisfaction. Whether you are seeking general ophthalmic care, cataract surgery with advanced technology intraocular lenses, iLASIK laser vision correction surgery, or Visian® ICL™ surgery, you’ll get the results you need and the care you deserve at Nevada Eye Consultants. Nevada Eye Consultant’s physicians are experts in the latest technology and procedures including intraocular lenses designed to provide distance and near vision without the use of glasses following cataract surgery. These revolutionary design lenses enhance a cataract patient’s ability to see at all distances without glasses or contact lenses. These advanced intraocular lenses utilize a proprietary optic design that will enable you to obtain the quality of vision you enjoyed when you were younger. You will be thrilled when you can focus on objects near, far and all distances in-between. Intraocular multifocal and accommodating lenses have proven to be an excellent treatment option for patients with cataracts and for presbyopia (the inability to see near objects) that often affects patients with cataracts. Nevada Eye Consultants is the only iLASIK certified laser center in Northern Nevada. iLASIK uses the most advanced laser technology available to create a precise LASIK flap using a laser, not a blade. Traditionally, doctors have used a hand-held blade called a MicroKeratome to perform LASIK surgery. iLASIK is the only 100% blade-free approach to laser vision correction surgery, and it’s only available in Northern Nevada at Nevada Eye Consultants. Whether you have nearsightedness, farsightedness, or astigmatism, you’ll get superior results from the iLASIK procedure. In our more than fifteen years experience working in the field of vision correction surgery, the physicians at Nevada Eye Consultants have performed more than 20,000 cataract surgery procedures and thousands of LASIK and iLASIK procedures. 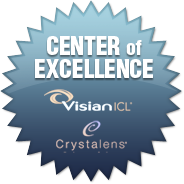 Nevada Eye Consultants was awarded Center of Excellence for Crystalens implantation, an honor received by only the top 100 centers nationwide, and awarded Center of Excellence for implantation of the Visian ICL, an award received by only a select few centers in the United States. Our patients include doctors, other Ophthalmic Surgeons, professional athletes, and celebrities. You’ll get the results you need and care you deserve at Nevada Eye Consultants.